There are several reasons why Starburst slot is so popular. First of all, it has very simple rules. Secondly, you may gain some free spins. And, finally, it has a pretty nice design. 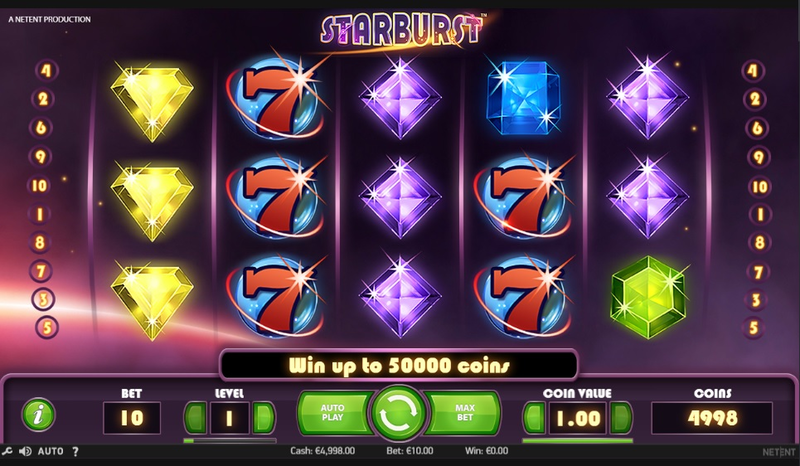 Starburst slot is a really popular creation of NetEnt. It has 5 reels and 10 paylines. The design is not really special, but still nice - you will see some shiny crystals and hear more or less pleasant music. And by the way, this game doesn’t have all those typical special symbols - it features only the wild symbol which looks like an eight-pointed diamond. Or star. Whatever. So, let our review to tell you a bit more about the wild symbols of Starburst. The Wild can replace any other symbol, but it appears only on the second, the third and the fourth reels. When you manage to collect 2 or more Wilds on those reels, you activate the Starburst Wild feature. In this case the symbols expand and cover the whole reel. And they stay there while the other reels re-spin! By the way, you re-spin them for free. If you get another Starburst Wild during the re-spin, it also expands and stays together with those symbols which expanded before. If you are lucky enough to collect 3 expanding Wilds, your winnings can be really impressive. But remember, that the round comes to an end when you have no new wild symbols after the re-spin. Starburst is a really simple slot. It’s all about wild symbols and free spins. And that’s it. There is nothing complicated about it, and that’s why it’s so popular. Yeah, there is no progressive jackpot here, but you can still gain a decent win if you are lucky enough. Follow this link to try the slot yourself.